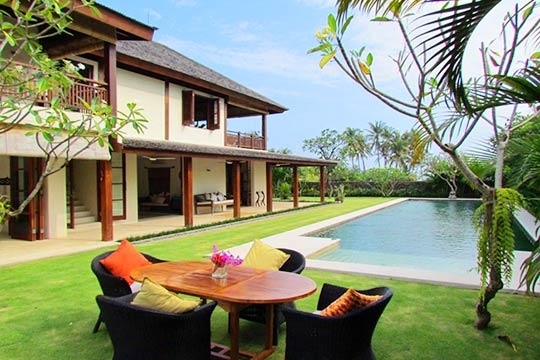 Three-bedroom Villa Sesapi offers an opportunity to experience real, away-from-it-all Bali in style. A contemporary home just a stone’s throw from the beach and one hour from Seminyak on Bali’s increasingly popular west coast includes a 20m pool, capable staff and unique service touches such as complimentary afternoon tea on Sundays. As you wind through acres of terraced rice fields and traditional villages in the Tabanan Regency, not too far beyond the famous Tanah Lot temple, you’ll quickly understand why this area is known for its agricultural landscape. First impression is that you are in the middle of what seems to be absolutely nowhere, although that’s just what the doctor ordered, right? 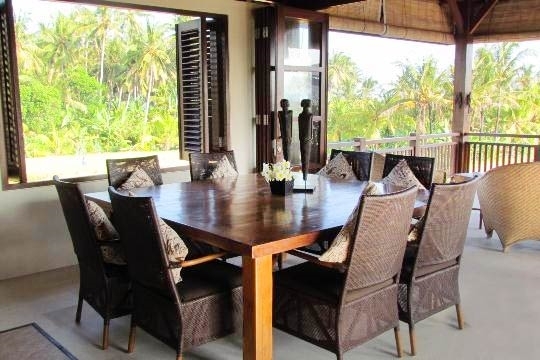 Forget Playstation, endless shopping expeditions and the soul-less humdrum of modern day-to-day living, Villa Sesapi is quite literally a breath of fresh air; a contemporary villa with three roomy air-conditioned suites set against a coconut-fringed black-sand seascape. But a walk along the sand shows that the secret is out of the bag; villa developments are springing up on Pasut beach, along with boutique resorts including the popular five-star Alila Soori just a 25-minute walk to the South. 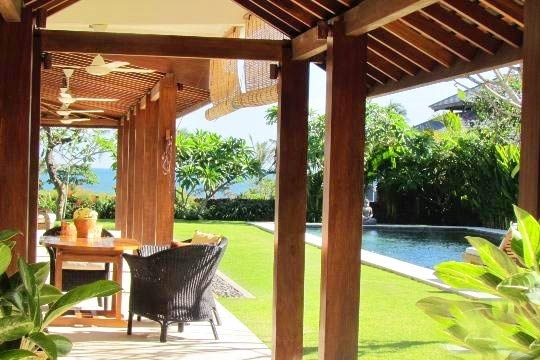 Instead of building at the very front of their oceanside plot, Sesapi’s Australia-based owners built 100m back from the shore so that the rhythmic sound of the waves is prevalent, yet not overbearing. 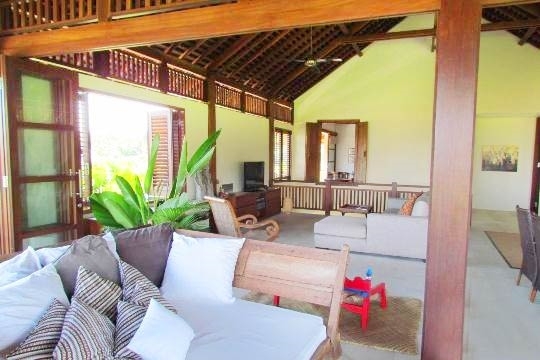 A consistent sea breeze naturally cools the second floor balé-bengong (open-sided living area) that overlooks the swimming pool, the perfectly manicured garden and the owner’s small working farm between the villa and beach which supplies the kitchen with fresh veggies. At the farm’s edge, right before the sand, is a bamboo gazebo perfect for casual sunset drinks. And while you enjoy a cold beer or glass of wine, the full-time kitchen staff is busy preparing your dinner of mildly spiced curry with tofu – purchased that day from the tofu maker next door – or chicken and sautéed Balinese greens seasoned with just the right amount of ginger. (Meals are ordered a day in advance from the villa’s selection menu and all provisions are charged at cost.) As the grandparents of four young grandsons, Villa Sesapi’s owners have trained their staff to place child-safe fencing upon request around pool and entry ponds. And for teenagers who might get a little stir crazy after a couple of days, ask the villa manager to arrange a private boat charter for three or four hours of fishing or leisure. If you come back with a catch the staff will be more than happy to grill it up for dinner. 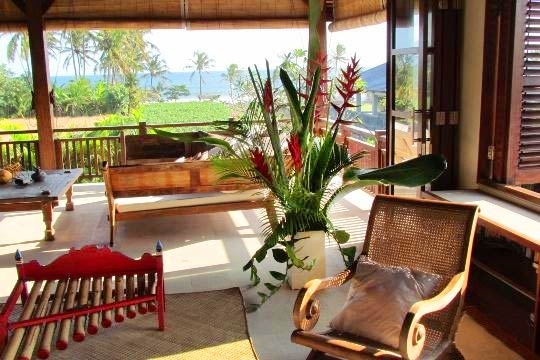 Upon arrival at Villa Sesapi, we were each offered a very welcome ice cold beer and ushered up to the open-sided living area where we could see the ocean and get a good sense of our surroundings. The journey out here is quite a long one (90 minutes from the airport) and it’s off the beaten tourist track, so the villa’s complimentary airport transfer is a definite advantage. As the sun lowered into the sea, freshly roasted peanuts and sautéed corn fritters with sweet chilli dipping sauce were brought to our table. These ‘on the house’ cocktail snacks became a much-anticipated nightly routine. In the early morning we set out to walk the black sand beach that has the consistency of fine powder, and watched the brightly painted fishing canoes come in from their overnight adventures. As it was still lobster season, the villa manager was able to track down two generous lobsters from a fisherman in front of the villa. The staff boiled and chilled the lobster meat, and prepared a delicious Thai-style salad for dinner that night. 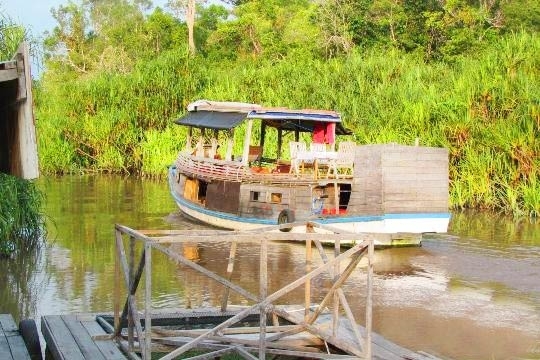 Villa Sesapi is more of a relaxing than action-packed holiday base, yet it’s easy enough to fill your time. By the second day our routine morphed into a nice rhythm, with a morning jog along the beach followed by a hard-earned breakfast of bacon and eggs while catching up on the news in front of the TV; then swimming in the pool and reading or napping on one of the day beds, a walk to the Alila for lunch and a spa treatment, and back to the villa in time for our sunset cocktail ritual. The layout here works well for families travelling with grandparents and young children who will enjoy the ground floor rooms, leaving mom and dad with the master suite upstairs – or for families with teenagers, who will want to take over the upstairs bedroom-media room combination. 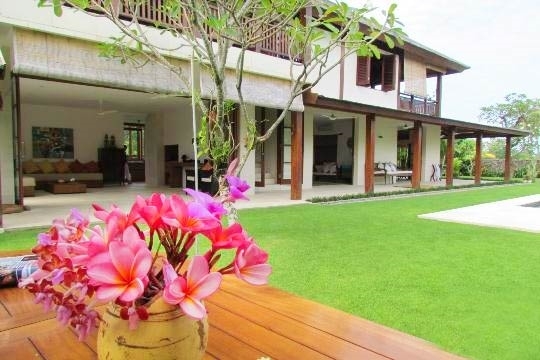 Villa Sesapi is the perfect entry villa for families who want to experience a less visited Bali yet one that provides all the comforts of home. 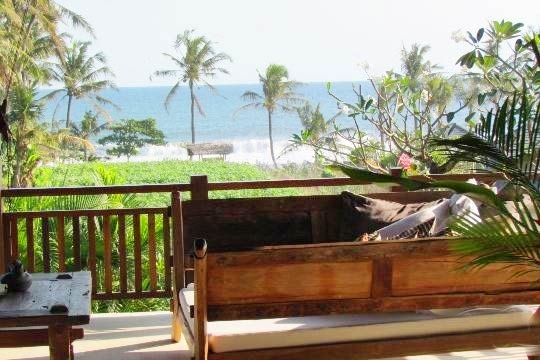 The real deal: one hour from the hullabaloo of Seminyak where you can still find working rice paddies and stretches of isolated beachfront and catch a glimpse of traditional Balinese culture. Once you reach the villa, you will not want to drive back into town to shop. Ask the staff to pre-purchase groceries before your arrival; they are used to doing the shopping at western grocery stores such as Carrefour. Overall this villa was amazing on every level. The staff was so great, the food was great, everything was clean and worked. This villa was as advertised and actually exceeded our expectations. Nice big pool. The only comment was the smoke that filled the yard when they were burning in the mornings, not much to do about that, wish someone would have given us a heads up though. I would recommend this place to anyone. It is in the middle of nowhere and you have to drive to get anything, but the staff made day trips for us, so it never felt like an issue. 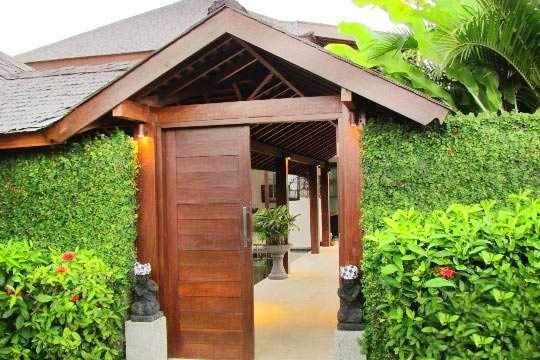 According to Sesapi’s owners, eight new villas have been built in the Pasut Beach area in the last year and a couple of boutique resorts with public restaurant facilities are in the pipeline too. But despite the flurry of development, the area remains predominantly agricultural. Pasut is a long black-sand beach between Tanah Lot (famous for its dramatic cliff-top sea temple) and the surfers haunt of Balian Beach; it’s not a swimming beach for beginners as the waves crash directly onto the sand and there is a very strong rip current along the shore. 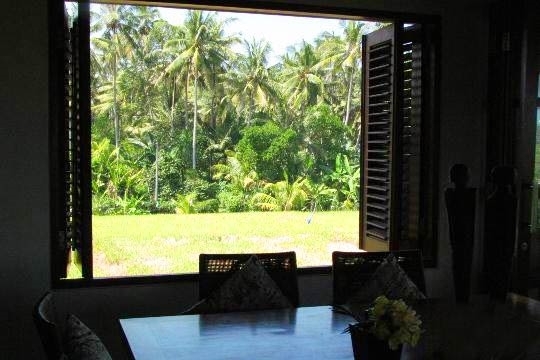 Views of the Bukit Peninsula from the beach as well as Mount Batukaru from behind the villa can be seen on clear days. 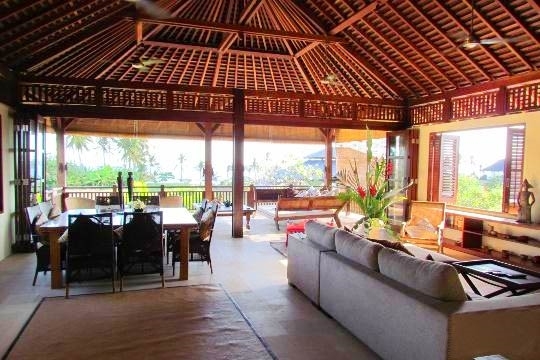 This villa was lovingly designed and built by a family who care deeply about Bali. From the covered walkway, meticulously handcrafted from rich Bankirai wood, to the poolside veranda, the ground level captures the essence of Bali’s flowing indoor–outdoor lifestyle that has been emulated the world over. 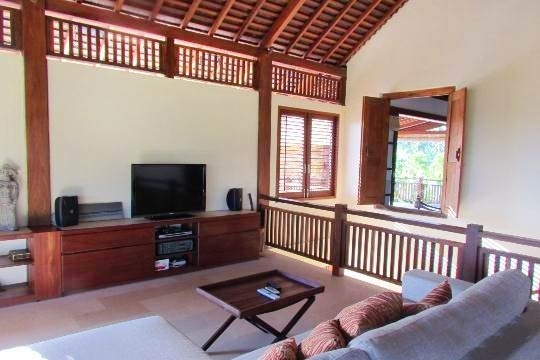 First stop is the casual yet well-designed fan-cooled sitting/TV room that can be fully enclosed or opened up to the garden and is furnished with two comfy rattan couches and a 42-inch flat-screen TV. A door at the back leads into the galley-style kitchen with rice-paddy views, polished concrete counters, two stainless steel fridges – one stocked with wine – pots, pans and a gas stove with small oven. 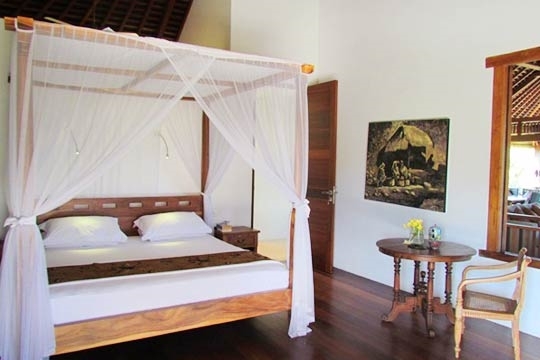 A covered veranda leads to two air-conditioned guest bedrooms, both generous in size and furnished with queen beds. Sliding doors face the contemporary rectangular pool surrounded by blooming tropical flowers and impeccably maintained lawn. The bedroom at the far end has a private sea-facing patio furnished with reclining lounge chair and overhead fans. 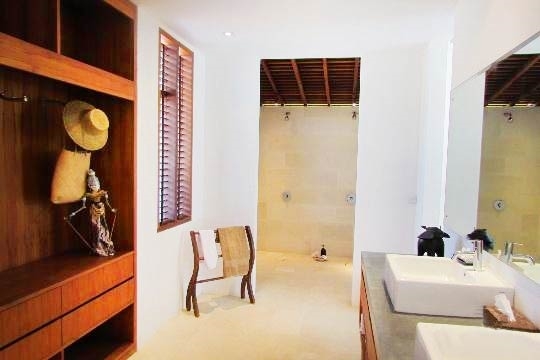 Both of the downstairs ensuites have generous walk-in rain showers and the sea facing bedroom takes the concept to a higher level with a double shower, perfect for families. A wide staircase leads up to the master suite which is furnished with a king-size bed and overlooks the swimming pool from its private veranda. 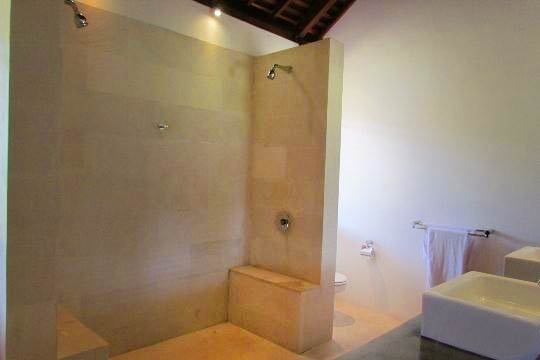 The ensuite bathroom here is fitted with double showers and vanities. Adjacent to the bedroom, and with a vaulted wooden ceiling, is the open-plan media and dining area. 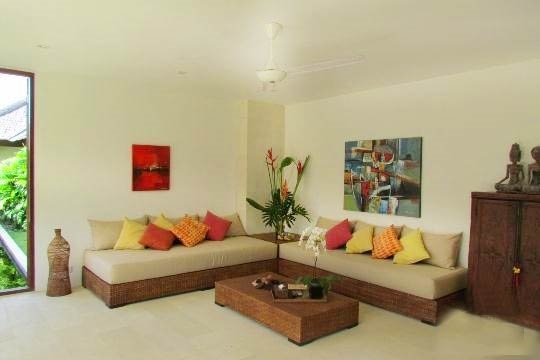 This is the family room, or heart of the villa, where movies can be watched on the 40-inch TV screen, meals can be enjoyed (the dining table seats eight) or guests can simply read or nap on the oversized daybed. This fan- and sea-breeze-cooled space is casually outfitted with a melange of both contemporary pieces and rustic Indonesian furnishings. The epitome of island-chic, this is the spot for afternoon tea and sunset drinks. 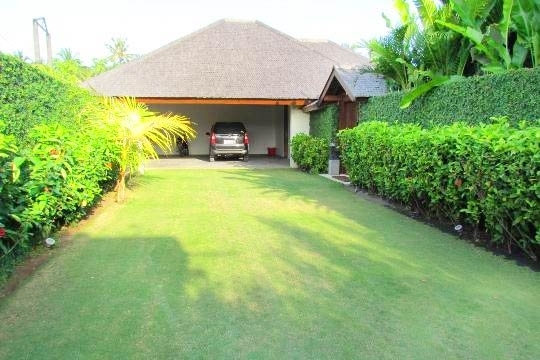 3 bedroom villa located in Tabanan, Bali. Ideal for Beach in ten, Body and soul, Kid friendly, Going for golf.